Since 1947, when Hoogvliet was still a village, this satellite town southwest of Rotterdam has expanded with some 15,000 housing units, mainly for workers at the nearby docks and refineries. Hoogvliet now consists of a centre with eight districts, each roughly the size of Pendrecht or Zuidwijk, ranged round it concentrically. A low embankment at the old village church is all that remains of its past. A modern open layout with many walk-up blocks now prevails. There is so much public greenspace that at the end of the 1960s Hoogvliet with its 40 square metres per inhabitant was the greenest settlement in the Netherlands. A shopping centre was built in the central area in the mid '60s. A metro line laid out in 1974 links Hoogvliet with Rotterdam. 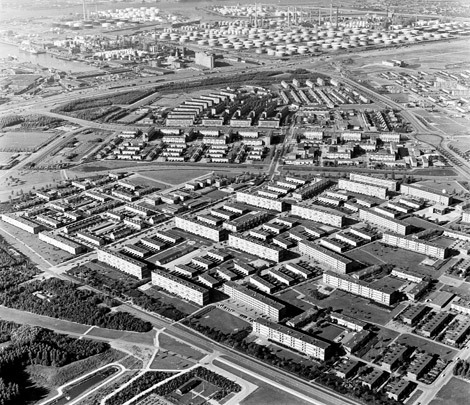 By the turn of the millennium Hoogvliet, more than any other product of post-war reconstruction with a one-sided housing stock, had acquired a negative image because of racial tension and crime. The necessary restructuring requires demolishing 5000 cheap, poor quality housing units and then building almost as many new units. The existing structures (district, traffic, greenspace) have largely been retained in the new urban layout. Hoogvliet is expected to be fully rehabilitated by 2015.